Today was Mardi Gras in New Orleans and the very first one that myself and Mr. Scott Green have missed. 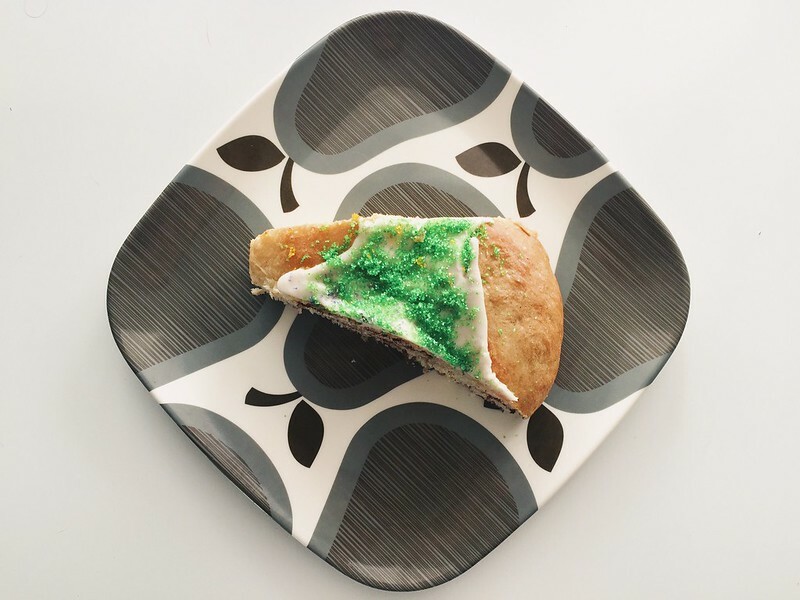 Feeling a little bummed to be missing the party, Scott made one of his amazing vegan king cakes. 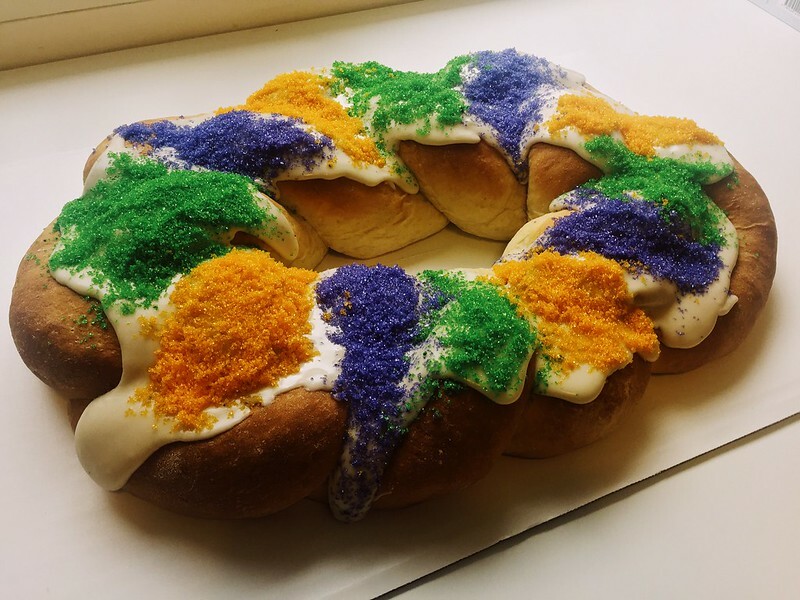 For those of you unaware, Scott revolutionized the vegan king cake market in New Orleans by putting these suckers into production at Whole Foods. While this recipe is similar, it has been updated for the home kitchen. Enjoy! To make the Dough, add all ingredients to a mixer with the dough hook attachment, and mix on low for 3 minutes and then on medium-high for 5-7 minutes. Cover the dough for 1 hour to allow dough to rise. Once the dough has risen, find a workspace at least 3ft wide and flour the surface. Cut the dough into two halves and sprinkle with flour. Roll each dough half into 2ft long strips about 6-8in wide. Combine cinnamon and sugar in a small bowl. Melt the margarine and spread it on the rolled out pieces. Then cover each dough half with the cinnamon sugar mixture, leaving 1/2-1in uncovered at the bottom. Roll each half (like a cinnamon roll) lengthwise forming a long roll. Braid the two halves together and form a circle with the braids. Place on a baking pan and pinch the ends of the braids together. Cover with a large plastic bag (like a garbage bag) and let the dough proof for an hour. Heat oven to 350 degrees and bake on a cookie sheet covered with parchment paper for 20-25 minutes, until the top is golden brown. Take out and let cool. 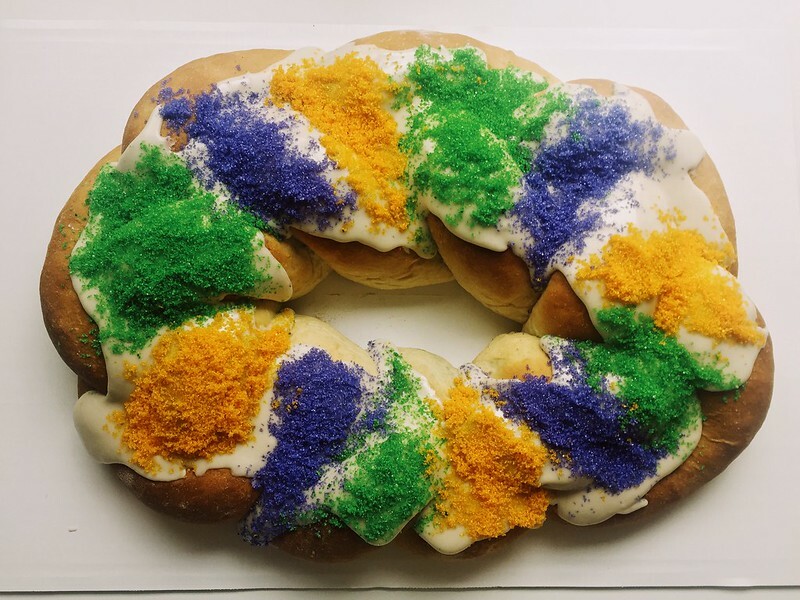 Pour and spread icing on king cake and sprinkle colored sugar on it. Hide the baby and enjoy.